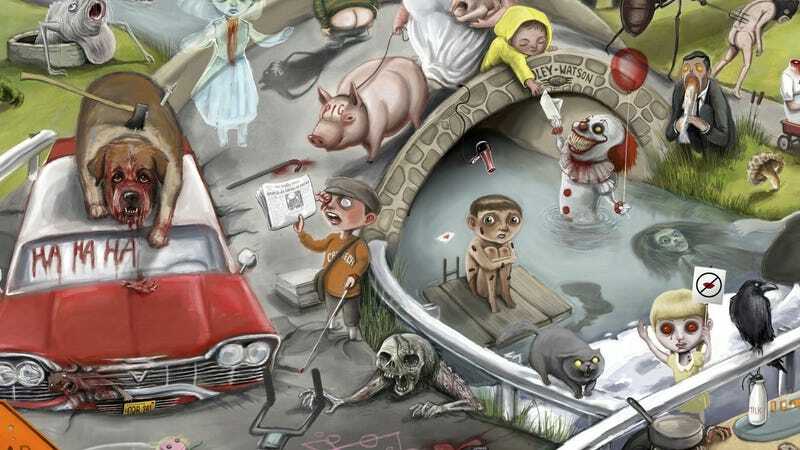 There Are Almost 200 Stephen King References on This Poster—Can You Name Them All? Thanks to It, Gerald’s Game, the upcoming Castle Rock, and even The Mist and The Dark Tower, Stephen King is hot in Hollywood again. But just because the film and TV industries are once again taking notice of the legendary writer doesn’t mean fans have ever forgotten him. Once such fan is artist Jordan Monsell. He has created this vivid poster he’s calling “King Country” that’ll first be on sale at this month’s Monsterpalooza in Pasadena, CA. It combines over 170 different King characters, references, and more into one image. Check it out. The main influence on this, of course, is Stephen King, but Monsell also cites Hieronymus Bosch and Pieter Bruegel as visual inspirations. As for the references, some of them are obvious. Others, not so much. It would take a true King fan to name them all and, thankfully, Monsell has provided a key that makes it easy to check yourself. The key for King’s Country. If you’d like to snag one of these 16x20 inch prints, they’ll be on sale at Table 97 at Monsterpalooza, taking place April 13-15 at the Pasadena Convention Center in California. Additional copies will go on sale at a later date and info will be on Monsell’s Facebook.